We stumbled upon a new (to us) brunch location recently that I wanted to share. Did you know that South Side in Tremont offers a Sunday brunch? Well we certainly didn't until we were dining there one evening, and when our bill came there was a small advertisement for their brunch at the bottom of the check. Being the brunch-lovers that we are, of course we headed back there a few weeks later to check it out. Now I have mixed feeling as I write this post, because if you follow me on Twitter then you know that "R" and I had a disappointing meal there the other night. The food was off--- components were missing and all three things that we ordered just didn't measure up to what we've experienced in the past. Not that SS has ever really wowed me or been a Tremont favorite, but at least the food has been consistently decent in the past and we do like the atmosphere and outdoor seating. And the mussels, Mmmm the mussels. But, I digress. So even though our most recent experience left me disappointed and swearing that we wouldn't be back for a while, I still feel compelled to write this post about our brunch. I was happy to see a lot of appetizing options on their brunch menu, including Chicken & Waffles, Crab Cake Benedict Florentine, Enchiladas and Eggs, and Pecan Crusted French Toast. Their menu rivaled one of our favorites- the Tremont Tap House. Now, how did they stack up? Not too shabby in my opinion. "R" ordered the Pigs in a Blanket with deep fried pancake batter sausage links served with cinnamon butter, syrup, two eggs, and hash browns ($9). From the bite that I stole, the flavors and textures were well-balanced. This dish did inspire us to try our own version tailgating this fall. I zoned in on the Breakfast Burrito with eggs, chorizo, veggies, Tex-Mex sauce, shredded cheese, salsa, and sour cream ($7). It reminded me of one of our favorite dishes at the Tap House, so I wanted to give it a try. I even added a side of hollandaise sauce so that I could compare apples to apples. Truth be told, it was a good breakfast burrito and I enjoyed my meal...but my heart still lies with the Tap House's version. 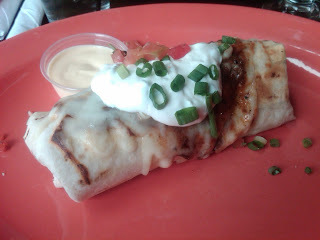 At South Side, I felt like we got a lot of "bang for our buck" with the brunch entrees prices at $9 and $7. We were seated on the enclosed patio with lots of sunlight pouring in, and brunch hit the spot that day. So just in case you didn't realize that this popular Tremont bar also serves brunch...well, now you know! i'm always "meh" about southside. the service is what kills me, it's the like staff is pained to be working. i.e. doing their job. but that being said, their food is usually good. I'm not a huge fan of South Side either (I get claustrophic in there every single time), but I do like their brunch - especially their wide selection of adult beverages during brunch. Delicious! SS is a great place to go drink. eating and/or getting great service is always hit or miss for us.